Is it just me, or are the conditions of visibility changing? Could be both, so let’s not bother with biographical angle: that I (or you) might be discouraged that a surreal blend of conservatism and chaos has hijacked the US government, or that we might be focused on private life now that it is both a more necessary haven and more at risk. But it’s not just me or you. If we sense something is changing, it probably is because something is changing. The Washington Post seems to think so. Their new slogan is “Democracy Dies in Darkness.” Not exactly subtle. Also too alliterative, and I love alliteration. In this case it might be symptomatic: a defense of Enlightenment values is stated via a rhetorical flourish. Both saying and showing are compressed into a text. Slogans have to do that, but the question remains of how much can be seen. The Trump regime is already shadowy, not transparent, absolutely not truthful while yet keeping its promises, and on the edge of darkness in the worst sense. It got there by riding, as did no one else, a major shift from news media to social media: that is, it provoked and benefited from the transformation of the news into the logics, habits, and vices of social media. CNN, I’m talking about you. Those that didn’t follow along were left behind. And now a lot of people are going to be abandoned. So we get to the photograph above after all. Eye catching, yet mournful: a visual art work of a sort. Fire implies action, eventfulness, but here it is at a distance. 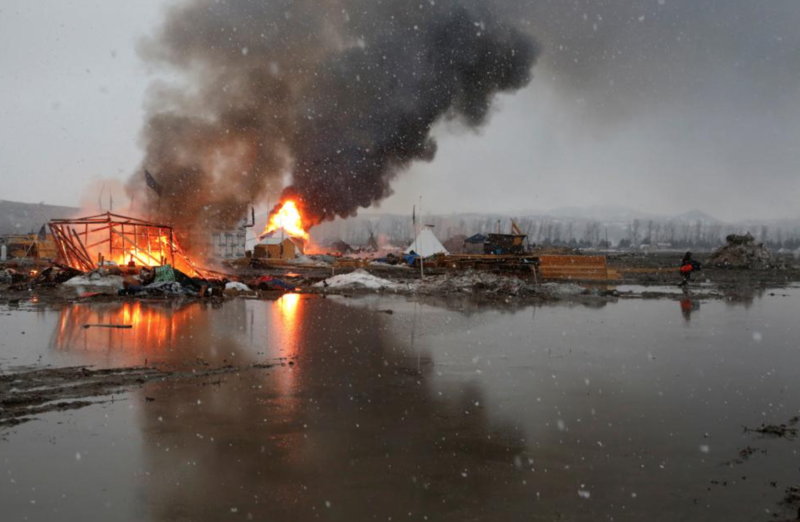 The spectator is separated from the burning lodges by a natural moat of prairie snow melt. The people there have acted by setting the camp afire, but they are not present–at least not visible directly. This camp near Cannon, North Dakota, for those protesting the Dakota Access oil pipe line is being abandoned in advance of the federal order to leave the site. One form of abandonment begets another: but only the second, lesser action leads to a distinctive image. The snow flakes on the image make the photograph reflexive: we are aware that it is a photograph, and one that is part of the wet, cold, dismal scene. Is it too much to say that we are looking through a glass, darkly? Darkness is part of the picture: overcast sky, thick smoke, its dark shadow on the dark water, muddy earth in the foreground, leafless trees, featureless hills, and haze in the background. Although at a distance from the burning, you are part of the much larger environment–one where darkness seems to have the edge. I’ve posted before that visual coverage of the Trump campaign was not a factor in his election. Part of the argument was that there just wasn’t much to work with. Now, even less. Too much of the damage is being done off-stage. Brietbart, fake news hackers, and the rest are assaulting language itself: the basic medium of the public sphere and deliberative democracy. Photojournalism has long been important because even good language wasn’t enough, and bad speech could be challenged with visual proof. But those public functions benefited from a media economy that is no more. Now it seems to me that the news photo too often is showing us only the aftermath. Witness the photograph above. The damage has already been done, and political resistance has turned into the paradoxical act of self-immolation. That apparently is what you have to do to get public attention, even if it is too little too late. By the way, I suspect that Trump also is disabling the effectiveness (though obviously not the incidence) of political parody and satire. That’s another post, but probably part of the same larger process. What has to be faced is that tried and true techniques may not be working as they should. If that is so, darkness will spread and democracy really will be imperiled. So what is to be done? We have options: as photographers, writers, artists, advocates, scholars, curators, . . . . citizens. We will need strong images, strong writing, and much more–not least strong collaborations and experimentation with new and old media forms. As for how to do that: perhaps you can tell me, or show me.